Are fleas a constant problem for you and your dog, especially during spring and summer? Is your dog allergic to flea medication? Are you looking for a natural alternative to killing fleas? Here is everything you need to know about tea tree oil for fleas. Skip to the bottom of the article to see our favorite tea tree oil products. Tea tree oil, aka melaleuca oil, is a popular natural treatment for many skin disorders. It is used to treat acne, insect bites, and fungal infections for both humans and pets. This essential oil is extracted from the leaves of a tree native in Australia – and is popular for its antifungal and antibacterial properties. Because of this, many veterinary skin care products contain small amounts of tea tree oil. Does tea tree oil kill fleas? Tea tree oil contains chemicals called terpenes that make it effective against bacteria and fungi. These chemicals also make this essential oil effective in killing and repelling fleas and ticks. Unfortunately, terpenes can be toxic when taken in large doses. Given the tendency of pets to groom, especially cats, the toxicity is amplified. That is why tea tree oil is not advised for use on cats. But is tea tree oil safe for pets? In small concentrations (.1% to 1%), tea tree oil is safe and tolerated for dogs. You can use tea tree oil for fleas, however, improper dilutions of concentrated oil can be ineffective or harmful. There is a proper way to use tea tree oil for fleas though! When used safely, tea tree oil kills fleas. Pet parents can use natural flea treatments containing tea tree oil. This is safer than diluting pure tea tree oil yourself and much safer than using chemical medications. Store-bought tea tree oil shampoos and sprays have small amounts of tea tree oil combined with other “good stuff” such as citronella, lemongrass oil, and lavender oil. These products are formulated by professionals so that oil is evenly distributed and reduces toxic risk to your furry buddy. You can check some of our suggestions below. Looking for natural products to help kill fleas and ticks? We did an extensive research and came up with these recommended products. They are all-natural and effective in the prevention, treatment, and control of fleas. Most of all, these are made with organic ingredients such as apple cider vinegar, other essential oils and tea tree oil for fleas. Try these tea tree oil products for pets! 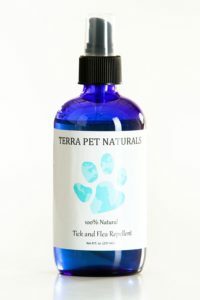 What I like about it: Unlike other products made with essential oils and alcohol, this 100% natural flea and tick repellent spray is made with essential oils and apple cider vinegar. This makes it effective in repelling fleas and ticks due to its acidity while nourishing your dog’s coat and skin. In addition, this product does not contain harsh chemicals, making it safe for puppies and dogs with sensitive skin. It can even be used by people and horses. Aside from tick and fleas control, it is also an effective pest and mosquito repellent. It even comes it a large 8 oz. bottle, so it definitely is value for your money. Most of all this product does not contain preservatives, pesticides, and harsh chemicals. Check it out if you are looking for an effective natural alternative to chemical treatments. 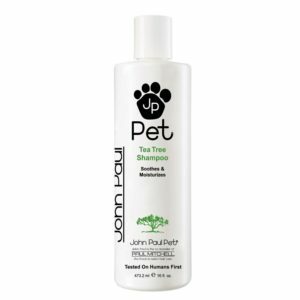 What I like about it: Looking for an effective and environmentally-safe natural shampoo for pets? The tea tree oil in this shampoo will kill fleas while helping soothe the coat and skin of your dog. Amazon users give this product a high rating because it treats the skin conditions of their furry buddies while also helping them smell nice and adding shine to their coats. If your dog is suffering from yeast, stink, allergies and skin problem, this shampoo is a good one to try. How do you use tea tree oil for fleas? Leave us some comments and tips. You may also want to read our complete guide on using tea tree oil for acne.